Dr. Thomas Terrill helps people around the world feed their families and improve economic stability. 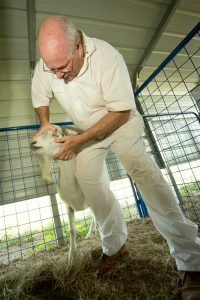 Selected earlier this year to serve three years as a Fulbright Specialist, Terrill, an associate professor of animal science, received his first assignment to South Africa scheduled in November. For three weeks, he will work collaboratively with international partners in educational, political, cultural, economical and scientific fields. During his stay, Terrill plans to conduct a research and outreach planning workshop and to introduce a new system. This system allows farmers to use their cellphones to access decision support software for needed information to keep their animals healthy or to better grow their crops. Terrill collaborated with a colleague from the University of Pretoria in South Africa and a computer modeler from the University of North Georgia (UNG), Gainesville campus, to develop the system. “There is a push now for precision agriculture. This will be almost like precision health management, where farmers can access all of the information they need very readily by the use of their cellphones,” Terrill said. Explaining the process, he said they will demonstrate how to work with computer modelers who will send information to a remote location and then develop algorithms to inform farmers when an animal needs to be treated or when a crop needs to be planted or harvested. He noted if there is an outbreak, then farmers can’t sell their beef. “With limited resources, if we can electronically pinpoint where these outbreaks occur, then they can focus all of their energy on stopping it,” Terrill said. The process involves using a receiver that sends a radio signal based on an animal’s level of activity. “You can tell if they’re stressed, diseased or under attack,” Terrill explained. “With HMD, it causes lameness, and the animal can’t eat very well because it has sores in its mouth. It affects their behavior significantly. Terrill said this concept came about due to a critical shortage of manpower for people of expert opinions to assist by going out to the farms in places like South Africa. Before leaving South Africa, he hopes to have a blueprint on how they’re going to move forward with funding the project and implementing it. “Up until now, we’ve described the potential for it, but now we have a critical team together and an initial model and we’ve demonstrated that it actually does work,” Terrill said. Furthermore, Terrill will speak at a conference in Cape Town. As the coordinator of a group called the American Consortium for Small Ruminant Parasite Control (ACSRPC), he will give lectures to students at the University of Pretoria on some of their work, such as the use of sericea lespedeza as a low-input crop that can be used to suppress internal parasites in animals and the potential use of this plant in southern Africa. The Fulbright Program aims to increase mutual understanding between the people of the United States and the people of other countries. Terrill is joining the flagship international educational exchange program sponsored by the U.S. government, alongside many distinguished figures around the world. The Fulbright grant to South Africa is made possible through taxpayer funds appropriated annually by the U.S. Congress and, in many cases, by contributions from partner countries and private parties. For more information about the Fulbright project, contact Terrill at (478) 825-6814 or terrillt@fvsu.edu.